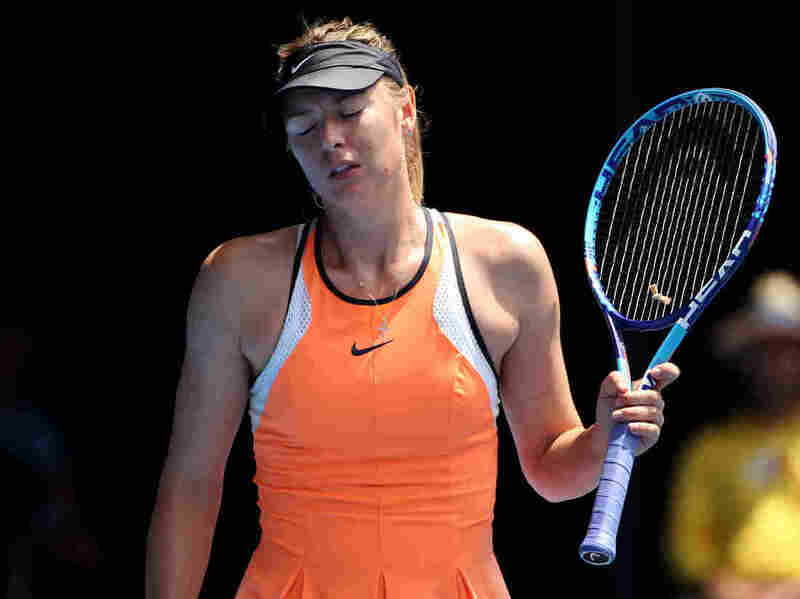 Maria Sharapova's 2-Year Doping Ban Cut To 15 Months : The Two-Way The tennis star was suspended from international competition after testing positive for the banned drug meldonium. She will be eligible to play again beginning in April 2017. Maria Sharapova during her quarterfinal match at the Australian Open tennis tournament in January. A drug test Sharapova took during the event later came back positive for the banned substance meldonium. The international Court of Arbitration for Sport has reduced tennis star Maria Sharapova's two-year doping ban to 15 months. In its decision, released Tuesday morning, the court cited Sharapova's apparent lack of knowledge that the drug she was taking — a prescription heart medication called meldonium that can improve blood flow — had been banned by anti-doping regulators. She had appealed the two-year sentence, calling it "unfairly harsh" in a post on Facebook. In another post following Tuesday's decision, Sharapova called it one of her "happiest days, as I found out I can return to tennis in April." She also called on the International Tennis Federation to look into better ways to notify athletes of changes to doping regulations. As we have reported, Sharapova has said she simply did not know the drug's status had changed. In March, when she announced she had failed the drug test, she said she had been taking the drug for years. "I did fail the test, and I take full responsibility for it. ... It's very important for you to understand that for 10 years, this medicine was not on WADA [World Anti-Doping Agency]'s banned list and I had been legally taking the medicine for the past 10 years. But on Jan. 1, the rules had changed and meldonium became a prohibited substance, which I did not know. ... I was given this medicine by my doctor for several health issues I was having in 2006." So, what's so bad about meldonium? In an interview with NPR this summer, Olivier Rabin, science director for the World Anti-Doping Agency, said the agency banned it on Jan. 1 after noticing that entire teams were taking meldonium, "which usually suggests a drug isn't being taken for medical purposes. How could every member of a team need the same medical treatment?" He also cited studies questioning the drug's safety. Sharapova first tested positive for meldonium in January during the Australian Open, where she lost to Serena Williams in the quarterfinals. The court upheld an earlier decision that stripped Sharapova of the ranking points she earned by making it to the quarterfinals, as well as any prize money. The 15-month ban is back-dated to Jan. 26, 2016, which means Sharapova will be eligible to compete in April 2017, in time for both the French Open in May and at Wimbledon in July.